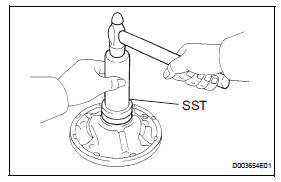 Using sst and a hammer, install a new oil seal to the pump. 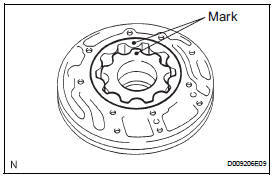 The seal end should be flat with the outer edge of the oil pump. Coat the lip of the oil seal with petroleum jelly. Coat the new o-ring with atf, and install it to the oil pump body. Coat the front oil pump driven gear with atf, and install it to the oil pump body with the marked side facing up. 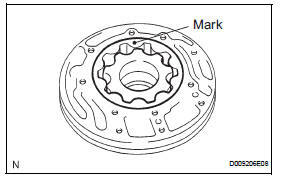 Coat the front oil pump drive gear with atf, and install it to the oil pump body with the marked side facing up. Set the stator shaft by aligning each bolt hole. Using a t30 ''trox'' socket, install the 11 bolts. Install the 2 clutch drum oil seal rings. Do not expand the ring ends excessively.